This case study illustrates the role of toxicological weight-of-evidence (WOE) in a motor vehicle accident case involving multiple pharmaceuticals. It also illustrates how drug interactions can be considered evidential in a toxicological causation assessment. On the evening prior to a serious motor vehicle accident, a woman who failed to stop at a red light was given a citation by a police officer and then escorted home. The woman ingested Xanax and Ambien just before bed. Upon experiencing difficulty breathing the next morning, she called her physician and was told to come to his office immediately. After dressing, she then ingested a dose of Prozac. While driving to the physician's office, she ran a stop sign and collided with another vehicle. After transport to the hospital for treatment, the woman was released but returned an hour later and remained for two days for treatment of asthmatic complications. 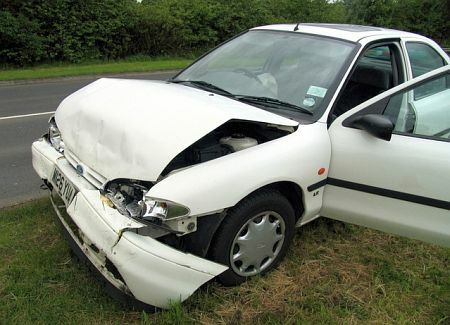 The driver of the other vehicle subsequently filed a personal injury lawsuit. Dr Sawyer was retained to conduct an objective toxicological assessment. Dr. Sawyer reviewed the police reports, the woman's deposition testimony and her medical history which was significant for treatment of depression and anxiety. She had also been diagnosed with asthma, fibromyalgia, anemia and hypertension. The records revealed that the woman had a history of losing consciousness due to her asthma. Dr. Sawyer performed a thorough review of the various pharmaceuticals that had been prescribed. Meanwhile, the forensic toxicology laboratory had conducted an independent analysis of her blood taken just after the accident. From this, Dr. Sawyer assembled a table comparing the reported blood levels with the therapeutic and toxic levels for each substance detected in the lab report. Side effects include drowsiness, dizziness, diarrhea and a "drugged feeling." Central nervous system effects include impairment of alertness and motor coordination. The manufacturer cautions that Ambien should not be taken with other medicines that can cause drowsiness. Abnormal thinking, behavior changes and complex behaviors such as "sleep driving" (i.e. driving while not fully awake after ingestion of a sedative-hypnotic with amnesia for the event) have been reported with Ambien. Drug interactions: Co-administration of Xanax (alprazolam) has resulted in increased alprazolam plasma concentrations and in further psychomotor performance decrement due to increased alprazolam levels. Other adverse effects of the central nervous system: insomnia, nervousness, anxiety, somnolence, dizziness, tremor, abnormal thinking. Adverse effects of the central nervous system include: drowsiness, light-headedness, confusion, nervousness and dizziness. Because this drug may cause dizziness or drowsiness, users should not drive or operate machinery or engage in any activity requiring alertness (generally requires tolerance and follow-up by the prescribing physician to be certain the patient is tolerating the medication without significant side effects). Serious side effects include: unusual risk-taking behavior, decreased inhibitions, no fear of danger, feeling light-headed and fainting. Co-administration of Prozac with Xanax is contraindicated due to potentiated increase of Xanax maximum plasma concentration. At 0.151 ug/ml the Xanax blood level was clearly in the toxic range. This high level was achieved through drug interaction producing an equivalent Xanax ingestion of 13.3 mg (approximately 6.7 tablets),3 resulting in substantial impairment. 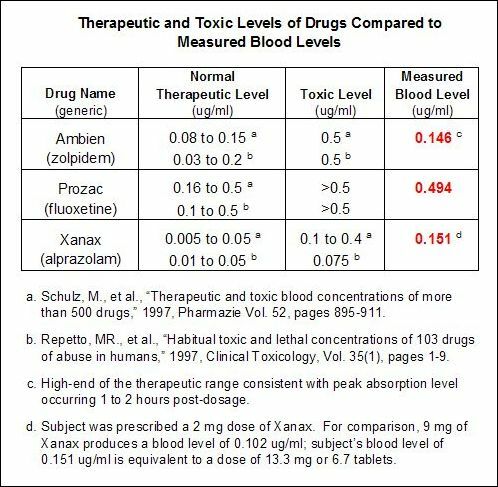 The Prozac blood level was at the extreme end of the therapeutic range at 0.494 ug/ml. Prozac is also known to increase the toxicity of Xanax. Calculations showed that the Prozac/Xanax interaction decreased clearance by 21%, enhanced the maximum plasma concentration by 46% and increased half-life by 17%. The symptomatic result of this enhancement was significantly decreased psychomotor performance. 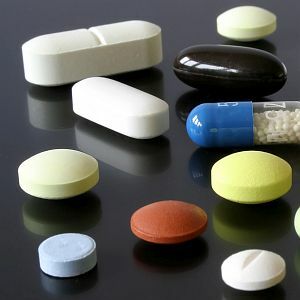 Dr. Sawyer was able to present compelling evidence to reasonable toxicological certainty that the additive effects of the pharmaceutical interactions, the self-administered doses and the times at which they were taken substantially contributed to predictable impairment at the time of the accident. His report was subsequently instrumental in a rapid settlement favorable to plaintiff. Baselt, RC, "Disposition of toxic drugs and chemicals in man," 6th edition, Biomedical Publications, page 33. "Dose and temporal relationships are critical factors in a causative assessment. Pharmacological interactions must be identified and quantified to establish an assessment outcome to reasonable toxicological certainty."